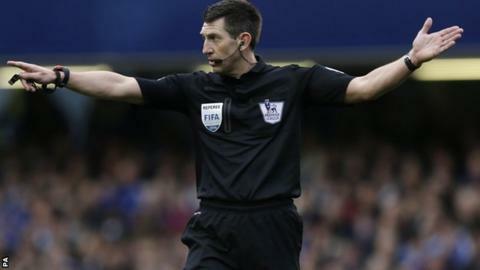 Lee Probert will referee the FA Cup final between Arsenal and Hull City at Wembley on 17 May. Referees are only allowed to take charge of the showpiece event once in their careers. Probert was the fourth official for the 2011 final. The 41-year-old from Wiltshire was promoted to the Select Group of Premier League referees in 2007. "To walk out as the referee for an FA Cup final is the highest accolade in English football," said Probert. Probert has refereed three FA Cup ties this season, including Hull's 1-1 draw at Brighton in the fifth round. After beginning his career in the Conference South, Probert was promoted to the Football League in 1998 and spent five years as an assistant referee. Reflecting on being handed this year's FA Cup final, Probert added: "The first person I thought about was my dad, who I lost six years ago. "He was always there to support me throughout my career and it's payback for all his hard work, taking me here, there and everywhere, encouraging me to never give up. When I walk out on 17 May, I know he'll be chuffed to bits."